Retractable utility blades are ubiquitous with contractors and construction companies but are also found in the toolbox of many home owners. A retractable blade utility knife is a great tool for cutting open boxes, scoring drywall, slicing and stripping wire, or almost any other job where a razor-sharp blade is needed. The fact that the knife's blade is retractable is a nice safety feature since it protects you from accidentally cutting yourself when you're not using the knife. Each utility knife opens differently and many modern models don't need tools to change the blade. Changing the blade in your retractable utility knife is not hard. Press the thumb button and fully retract the blade into the knife's housing. Use the flat-head screwdriver, if needed, to open the knife's housing. On older models there is one screw holding the housing together. 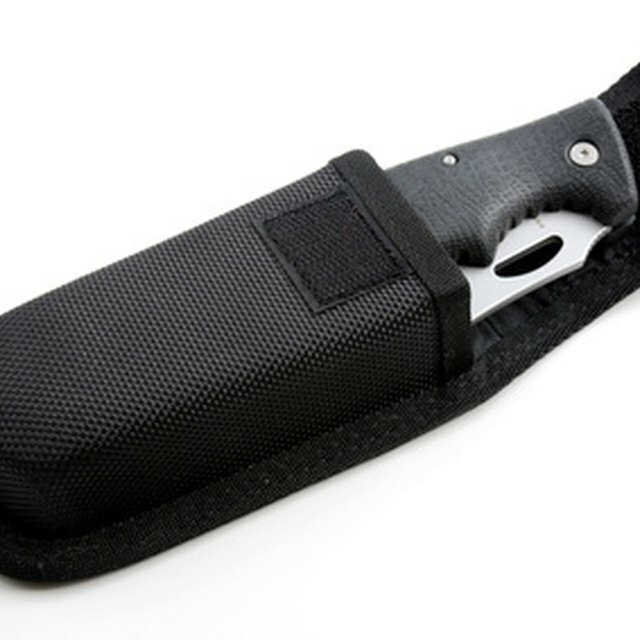 On newer models the housing opens by releasing a tab or rotating a portion of the knife open. Remove the dulled razor blade with caution to prevent cutting yourself. Insert the new blade. Close the knife housing. Press the thumb button to test whether the blade will expose and retract properly. Dispose of the used blade safely. In most models, you can use both ends of the razor blade in the knife, so changing the blade may just mean flipping over the razor blade. To avoid confusion over whether or not an end has been used, mark used ends with a permanent marker.